I bought some UMI upper & lower control arms ,and they come with Standard Pro forged Ball joints. I have brand new in the box pro forged tall ball joints. My question do I just install the tall ball joints on the uppers and leave the standard ball joints on the lowers? Or fo I install tall ball joints on both upper and lower arms? I have 2wd blazer OEM spindles & I will also be installing Aldan American coilovers with the arms. I just installed ProForged 1/2" taller upper ball joints in mine and left the lower BJ stock. maybe not completely, but it's reduced significantly. UMI Tubular Upper & Lower control arms also aid by relocating the position of the ball joint and facilitates greater adjustments (caster / camber) by your front end alignment expert. Thank you for your input! Bumpsteer is the only issue setting me back from fully enjoying my GN after its 15 year hibernation. If the UMI upper arms will work with the tall ball joints, install both the tall uppers and lowers. It is the tall lower ball joints that eliminate the bumpsteer. Thank you! That was the answer I was looking for. The answer you got is not accurate. 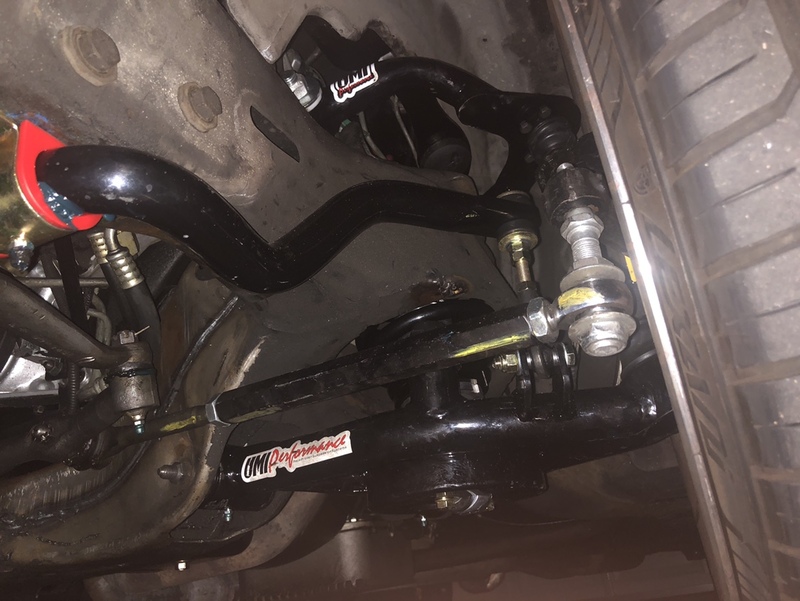 Bumpsteer is a function of the lower control arm, spindle, and the tie rod ends. The upper ball joint does not affect bumpsteer. The lower ball joint directly affects bumpsteer. Do not replace the lower ball joint with something of a different length without some kind of bumpsteer correction. There is no bolt and go bumpsteer correction. It's something you must install, measure, adjust, and measure again. The UMI kit gets you close. I am installing UMI upper control & lower control arms with coilovers, umi sway bar and a bumpsteer kit being installed. I figured I install the .5 ball joints which will lower the car 1” and then lower 1” on the coilovers. And should retain the stance I currently have. It's something you must install, measure, adjust, and measure again. The UMI kit gets you close. What do you use to measure ? The easy way is to set up a grid on a piece of wood (peg board with the holes connected in sharpie works) and put that in front of the car. Then you get the car up off the ground, remove the wheels, front springs and shocks. Attach a laser pointer to the wheel hub so it paints a dot on your grid. Draw a plumb line through the dot on your grid. That's your toe line. Then you cycle the suspension up and down and measure where the dot goes. If it moves left or right of the toe line as the suspension moves, you have dynamic toe change, aka bumpsteer. Adjust the tie rod pick-up point until you minimize the lateral movement of the dot. It sounds simple, but it's time consuming. Each time you adjust the pick-up at the steering arm, you have to set the suspension to ride height, reset the toe, then cycle and measure. Then repeat. It's nearly impossible to get truly zero bumpsteer, but you can get close. Repeat on the on the other side. Any alignment shop can do this? Virtually zero alignment shops can or would be willing to do this. You're on your own. A well equipped stock car shop may be able to help. An interesting read here. Especially the second paragraph. It explains why a laser pointer on the wall should not move in a straight line. Doing it with a bumpsteer gauge is very much preferable to the laser pointer method. But depending on how many times you're going to do it (probably once? ), it might not be worth the cost. If you could borrow one, that would be the bees' knees. Ended up installing upper and lower tall balljoints and only lowering the car 1” on the coilovers and aligning to UMI spec sent with the A arms and seems like my bumpsteer is pretty much gone! I found a shop that would do the bumpsteer measurement but figured I aline it and try it first since a rate of price could not be given. For the first time ever my Gn was able to go 55 mph+ with it haveing me fear for my life. Thank you to all who responded with the knowledge and know how. Now I just need to adjust the aldan american shocks to a bit stiffer setting. 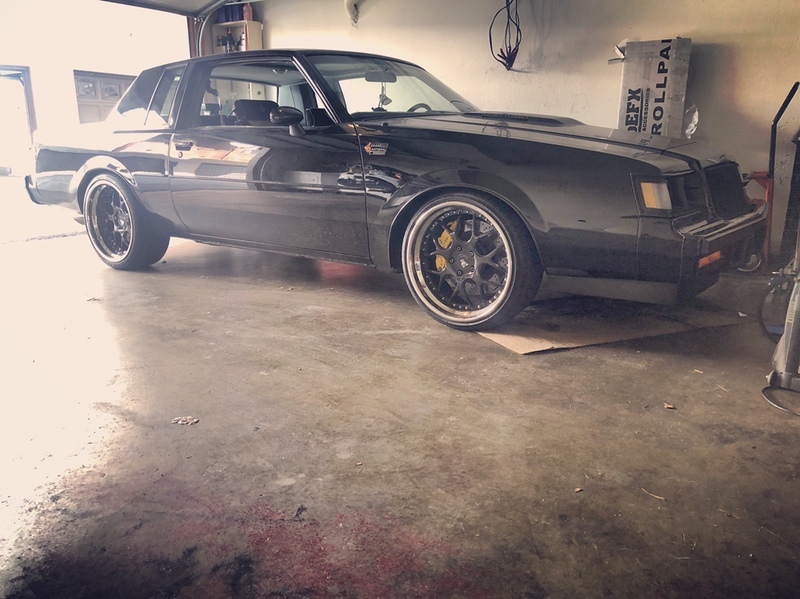 One more question somewhere I read that the Gnx inner fender wheel wells had the the GN bulge removed??? GNS Performance has the wheelhouse extensions that trim the inner fenderwell only, whereas the whole fender was cut out on the GNX. Here are some photos of the GNX fender mods I've found over the years wondering the same thing.